Although incense is an important player in Messe de Minuit, the note is by no means dominant, as it is in another incense favourite, Armani Privé Bois d’Encens. The woody sweetness of cinnamon, the cold smoothness of myrrh and the animalic richness of amber create the complex tapestry of the composition, along with the resinous incense. The most alluring aspect of wearing Messe de Minuit is that the fragrance conjures all sorts of images for me, from the serene ruins of Roman baths that I visited in England to the melancholy beauty of wooden village churches I saw in Ukraine. For this reason, Messe de Minuit never ceases to surprise me with yet another association that it draws from the depth of my memory. Messe de Minuit is not a fragrance of darkness. It is a fragrance of shadows, alternating between dusky and luminous notes. In many ways, Messe de Minuit makes me think of Hector Berlioz’s Symphonie Fantastique, in which the idée fixe, an exquisitely beautiful theme representing the composer’s beloved, recurs again and again. The idée fixe of Messe de Minuit is comprised of soft lemony floralcy, which weaves around the main facets of the composition. Even when the base notes embrace the skin with their spicy resinous darkness, the floral radiance shimmers subtly beneath. Finally, much like Symphonie Fantastique, Messe de Minuit is simply haunting. Messe de Minuit has a decent tenacity, but the sillage is not particularly strong. My definition of a perfect sillage, or trail left by the perfume wearer in his/her wake, is Guerlain L’Heure Bleue. Low sillage would be Annick Goutal Mandragore. Messe de Minuit falls in the middle. It includes notes of bergamot, mandarin, orange, galbanum, cinnamon, myrrh, incense, patchouli, amber, musk, honey. Etro fragrances are available at Aedes, Beauty.com or Neiman Aarcus, UK-based Escentual in the UK, and Belgium-based Senteurs d’Ailleurs. 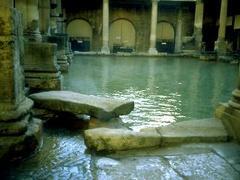 Photo of Roman Baths from Carfaxhotel, Bath, UK. What a beautiful review! I must admit that I have been rather afraid to test this one because I've thought of it as an incense heavy-hitter, but now I really need to! What a wonderful description!! I love this fragrance, and I've been wearing it repeatedly this winter. I find it surprisingly helpful when I want to get some work done. I'm also quite fond of the "Marina special" (excellent for bad moods)--Messe de M. + Yatagan! My sister-in-law is buying herself a bottle of this, having worked through three decants supplied by me... she was one of my early tests: if you spritzed a volunteer with MdeM, the "famous Goth scent," only they didn't know any of that goth folderol, how would they feel about it? On her it smells, interestingly, like cinnamon roses. What a beautiful description you have --- a fragrance of shadows. My favorite Etro, for pensive moods. It is definitely not an overstatement. Nothing else Etro has done is *that* interesting. This is one of my absolute favorites. An arresting review indeed! Although for/on me MdM is a scent of bright, almost aggressive sunshine with welcome touches of cool shade weaving though it. A scent of August in the Pyrenees, thorny, prickly, often fragrant vegetation, overgrown ruins, cracked earth, burnt trees and whistling winds, cork oaks.....and tiny churches and ancient dolmens offering welcome shade and relative coolness in the sun-baked land. No mildew. Heat. Like SL Miel du Bois, this is one of those fragrances which speak to the wild thing buried deep inside me, the one who would howl with the wind and dance in the thorns, intoxicated with the freedom of it all. Entirely agree that MdM is Etro's most interesting scent, but I can't adore it as I do Shaal Nur. I love that movement as well. It is one of the most haunting pieces of music I have heard. N, I do not think that incense is a heavy-hitter here, although it is definitely apparent. I just find other notes to add their own effects. J, I confess that I have not tried the Marina special yet, but I will tonight. Sounds like it would be quite amazing. Elle, I also love fragrances that stay close to the skin. I love getting a whiff as I go about my work, etc. However, sometimes I crave something that makes a statement, dramatic albeit tasteful. March, it is interesting to see how some people absolutely adore it and others hate it. I love the idea of MdM being cinnamon roses. Perfect! Marina, I agree. There are many successful fragrances, but Messe de Minuit is truly outstanding! Dinazad, I enjoyed reading your description and especially the last part: "this is one of those fragrances which speak to the wild thing buried deep inside me." How true! R, I have been there a few times. These Roman baths are quite amazing. The level of sophistication in construction and aesthetic details is what stands out in my memory. I've been wearing Messe de Minuit on and off for years; it's my most treasured scent. You mentioned the "Marina special," and I wonder if you could tell me exactly what that is. I've been searching for it on the internet with no luck. Thank you so much. Your site is fascinating! Never mind the previous question. I re-read and was enlightened.